A man accused of killing a father and daughter in a house fire has been found guilty of their manslaughter. Daniel Jones, 29, set light to a house in Stanley, near Wakefield, in 2016 in a bid to destroy evidence of a burglary nearby. 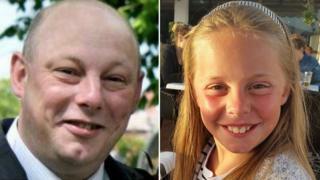 Andrew Broadhead, 42, and his daughter Kiera, eight, died in the fire. A jury cleared Jones, of Knottingley, of two counts of murder but convicted him of manslaughter after more than three hours of deliberation. Jones, from Spawd Bone Lane, had poured petrol through the letterbox of the Broadheads' house and set it alight in the early hours of 19 October 2016. Leeds Crown Court heard he did so because he was worried CCTV footage from the house would show he had stolen a safe from a friend's home on the same road a few days earlier. Mr Broadhead, his wife Sara and their daughters, Mia and Kiera, were asleep when the fire broke out. Mrs Broadhead and Mia managed to escape but her husband and younger daughter were overcome by smoke and pronounced dead at the scene. During the trial, prosecutor Jonathan Sharp told Leeds Crown Court that Mr Jones "did not set fire to the Broadheads' house because he had some sort of grudge against them". "He did it because he wanted to destroy evidence of another crime that he had committed a few days earlier," he added. The court heard it was "certain" that anyone in the property at 55 Ash Crescent would have been at risk of serious injury or death. The jury also found Jones guilty of one count of burglary in relation to the theft of his friend's safe. He was remanded in custody and will be sentenced on 9 November.